An eclectic journey of solo, acoustic, fingerstyle guitar. 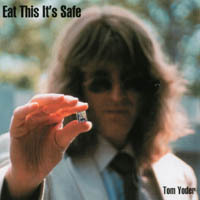 We are pleased to announce the release of Eat This It's Safe, the masterful debut CD by Tom Yoder. In the past, Tom's electric guitar playing earned him comparisons to Joe Satriani, Steve Vai, Django Reinhardt, and Al DiMeola. With the release of his debut CD, Tom blends his own unique acoustic guitar style with a splash of influences the likes of Michael Hedges and Leo Kottke. Tom's music is a delicate yet powerful acoustic guitar journey that combines many playing styles into a cornucopia of lush sounds. These vibrant excursions evoke warm emotion that are sure to relax and intrigue. Tom has been dazzling audiences in the Southeast with his guitar wizardry and technical brilliance for the past two decades. After graduating from The Guitar Institute of Technology (GIT) at The Musician's Institute (MI) in Los Angeles, California, Tom settled in Myrtle Beach where his legendary career began. He has been the premier guitar instructor in South Carolina since then. As an instructor at Coastal Carolina University (former USC Coastal Carolina College), his influence reaches far into the music scene in the Southeastern United States. Eat This It's Safe was recorded by Mike Gardner at Mike Gardner Studios in Raleigh, North Carolina. Mike is known for recording many regional artists including Far Too Jones. The CD was mastered at The Kitchen Mastering by Brent Lambert in Carrboro, North Carolina. Brent has mastered CD's for artists such as the Squirrel Nut Zippers. According to Jack Troy, Negative Records President, "Tom Yoder is an unbelievable guitarist and I am pleased that he has finally made a recording." Mark Leaman, owner of Generation CD's, stated, "Tom Yoder is the Saturn in a Solar System of guitarists." Tom has established himself as a musical staple in the Southeast and has proven it with the release of Eat This It's Safe. A song from the CD, "Mashu Mashu," was a Finalist in the 2002 Independent Music Awards New Age category. Songs from the CD have been featured on public radio stations throughout North and South Carolina on such programs as "Walter Edgar's Journal". The popular daily National Public Radio program, "All Things Considered" has also chosen to feature some of Tom's compositions as segue music during the show. Tom also contributes a column to the web site www.acousticguitarworkshop.com, an educational resource for the novice as well as professional guitar player.